Lady Snow Blood (Image, Motion, Sound) — Luke Waller. As previously discussed, there are so many influences that helped Quentin Tarantino build Kill Bill into the master piece it is. The main one however, is Lady Snow Blood, directed by Toshiya Fujita in 1973. So many elements of this film have been referenced by Tarantino that its quite incredible, in fact I think the thing that makes this not a remake, is that Kill Bill has so many other references that also contribute a lot to the film. It isn’t just cinematic shots that he has borrowed though, other similarities are the strong female lead characters, the music, the scenes, the dark themes and extreme use of blood and finally as you can see from the images below the whole visual language of the film appears to be borrowed, especially in KB Vol. 1. Above we see Tarantino lift almost an entire scene from Lady Snowblood. He also uses it at the end of the first film in much the same they do in LSB. It is quite strange to see not only similarities in the characters and cinematic shots but also the scenery and movement/stage direction of the characters, the contexts in both films at this point are nearly the same as each other so you can see for this section he has heavily relied on LSB. The above comparison looks at promotional shots of the characters, although Lucy Liu doesn’t play the good guy in the film you could say that they moral compass of the characters is similar, it just so happens that she is bested by Uma’s character. I like that even the set seems similar, they both feel in these shots almost like stage sets, in other words they are not sweeping landscapes that dwarf the characters. Instead they are both contained within a snowy garden which is calm and peaceful, this mirrors the characters poise. I find it funny that both characters are wearing loose sleeved traditional female clothing which doesn’t seem like it would be good to fight in. Compare that to Uma’s outfit which as we talked about before is referencing Bruce Lee’s outfit in his final film. So one wearing a traditional outfit the other in a more western, sporty outfit. I feel that these are significant differences that represent the different personality and statuses of the characters. one being loud and more out going, the other calmer and more traditional, maybe more bound by tradition thus constrained. Top Image - Lady Snowblood. Below - Kill Bill. This reference is very heavily talked about online as Tarantino uses this particular shot in almost all his films (See above for the other film references). 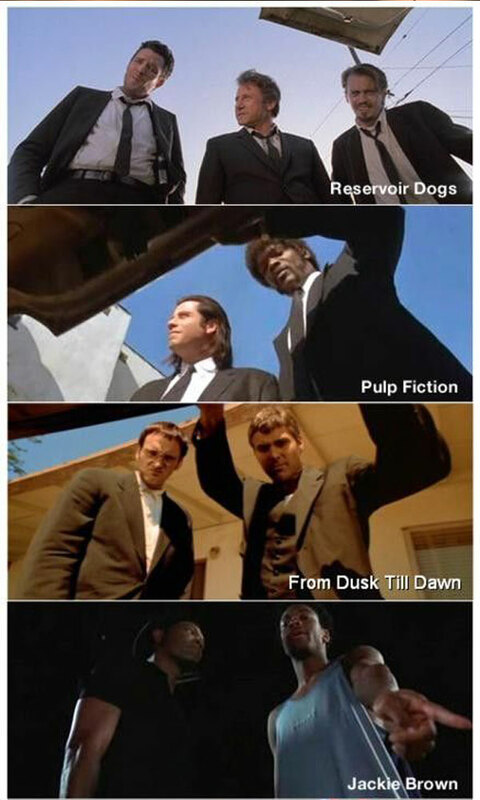 This is the first time you can knowingly say that LSB has influenced Tarantino previously, maybe it is a quite a small reference compared to the ones above but i like seeing how he uses these in just a small way, and also how influences of certain films, like LS grew to the point where he was basing whole films of it. Other examples where Tarantino has used the 'Trunk shot' first seen in LSB. The final reference I found is the two images above. Again it is a cinematic shot choice rather than something more detailed like the characters but this still builds and contributes to the overall visual language of the film having the same feeling and direction. In fact I would say that the shot choice probably builds to this more than the out and out obvious references because when its too easy to spot the difference people end up saying ‘oh its just a rip off’ or ‘it’s just a remake’, which i have to say I don’t agree with. Nether the less I think all these subtle shots help give kill bill a dynamic fresh feel which LSB had as well.